Months ago, the Department of Justice botched a redaction in a court filing, publicly revealing that Wikileaks founder Julian Assange had already secretly been criminally charged by someone in the DOJ. This has led to a number of still-unanswered questions about when or if the United States intends to seize Assange, or if the charges were simply intended to establish a larger conspiracy. Now we suddenly have a lot more questions. It started on Thursday afternoon when Jake Sherman of Politico cited flight tracking information which revealed that “someone flew the DOJ G5 from DC to London Tuesday.” Ken Dilanian of NBC News then added that “It actually took off from Manassas, which is where [the] FBI stations folks who go overseas to grab fugitives.” This led to questions about whether perhaps the plane had been dispatched to pick up Julian Assange, who has been in the basement of the Ecuadorian embassy in London for several years. That’s when WikiLeaks spoke up about the flight. So now we know that WikiLeaks cares a lot about this particular fugitive flight. But that could be for any number of reasons, whether it be knowledge/fear that Julian Assange is the fugitive target, or simply general concern that the DOJ could be scooping up someone the Kremlin doesn’t want scooped up. 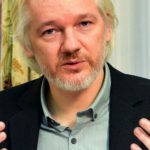 Several major news outlets have reported in recent months that Ecuador was preparing to hand Assange over to the UK government, which has an extradition treaty with the United States.